As far back as 6050 BC, salt has been an important and integral part of the world’s history, as it has been interwoven into the daily lives of countless historic civilizations. Used as a part of Egyptian religious offerings and valuable trade between the Phoenicians and their Mediterranean empire, salt and history have been inextricably intertwined for millennia, with great importance placed on salt by many different races and cultures of people. Even today, the history of salt touches our daily lives. The word “salary” was derived from the word “salt.” Salt was highly valued and its production was legally restricted in ancient times, so it was historically used as a method of trade and currency. The word “salad” also originated from “salt,” and began with the early Romans salting their leafy greens and vegetables. Undeniably, the history of salt is both broad ranging and unique, leaving its indelible mark in cultures across the globe. Salt motivated the American pioneers. The American Revolution had heroes who were saltmakers and part of the British strategy was to deny the American rebels access to salt. Civilian distress over the lack of salt in the wartime Confederacy undermined rebel homefront morale too. Salt also had military significance. For instance, it is recorded that thousands of Napoleon's troops died during his retreat from Moscow because their wounds would not heal as a result of a lack of salt. In 1777, the British Lord Howe was jubilant when he succeeded in capturing General Washington's salt supply. "Similarly, throughout history the essentiality of salt has subjected it to governmental monopoly and special taxes. 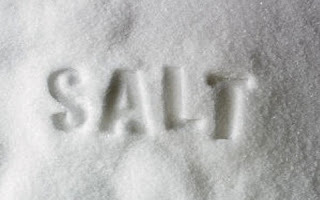 Salt taxes long supported British monarchs and thousands of Britishers were imprisoned for smuggling salt. French kings developed a salt monopoly by selling exclusive rights to produce it to a favored few who exploited that right to the point where the scarcity of salt was a major contributing cause of the French Revolution. In modern times, Mahatma Gandhi defied British salt laws as a means of mobilizing popular support for self-rule in India." In 2200 BC, the Chinese emperor Hsia Yu levied one of the first known taxes. He taxed salt. In Tibet, Marco Polo noted that tiny cakes of salt were pressed with images of the Grand Khan and used as coins. Salt is still used as money among the nomads of Ethiopia's Danakil Plains. Greek slave traders often bartered salt for slaves, giving rise to the expression that someone was "not worth his salt." Roman legionnaires were paid in salt—salarium, the Latin origin of the word "salary." Merchants in 12th-Century Timbuktu, the gateway to the Sahara Desert and the seat of scholars, valued salt as highly as books and gold. RON: That’s why I would like to connect the essence of Elias with salt. ELIAS: Ah! Very good! Two points! "according to the British Medical Journal, the real serial killer sits in a shaker on almost every table in Britain." "SALT hidden in food kills millions of people worldwide. This is the ethical justification for public health interventions in salt consumption. The US Institute of Medicine recommended government intervention to reduce salt intake."